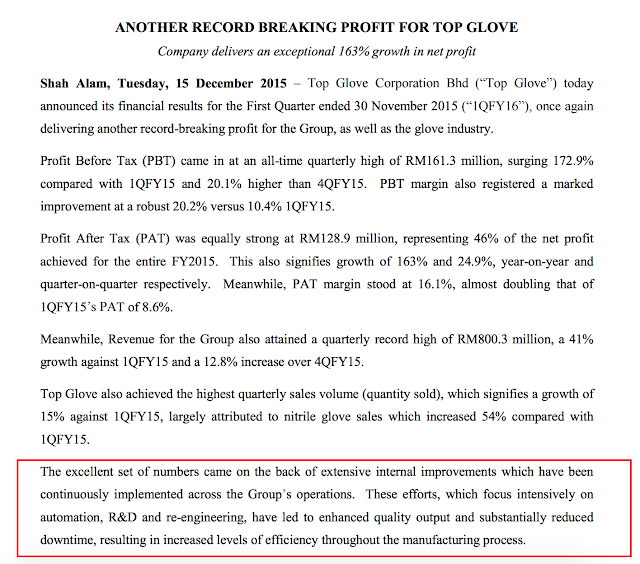 Top Glove is a company which has done very well over the last decade or more. It has done well for itself, shareholders and the management. The CEO has done well too hence it has grown into the largest rubber glove company in the world. There are not much it needs to prove but to be more honest and be transparent for its shareholders. I wrote an article last year. Actually the gist of that article was on Top Glove. It is easy to think that all companies that sells overseas (exports) their goods or services will do well in 2016. Nobody if I were to ask 12 months ago would think that our Ringgit would have dropped to 4.30 against USD. Nobody would expect the unusual exposure of the supposedly wrongdoings of our government would happen in 2015 - true or not many still think that it is true. Same things may happen again for 2016 - I don't know. If one is to look at now, companies that mainly depend on local input cost and sells overseas would be an easy pick. They are of course all the companies such as the rubber gloves - Top Glove, Hartalega, Supermax, Kossan - or companies like Wellcall, Chin Well or the furniture companies like Latitude, Homeritz - or those in the electronics exports - Inari, Vitrox or even the new kid on the block, Aemulus etc. Would they continue to perform. All these companies have already done well and their shares have reflected that - some have increased many folds. 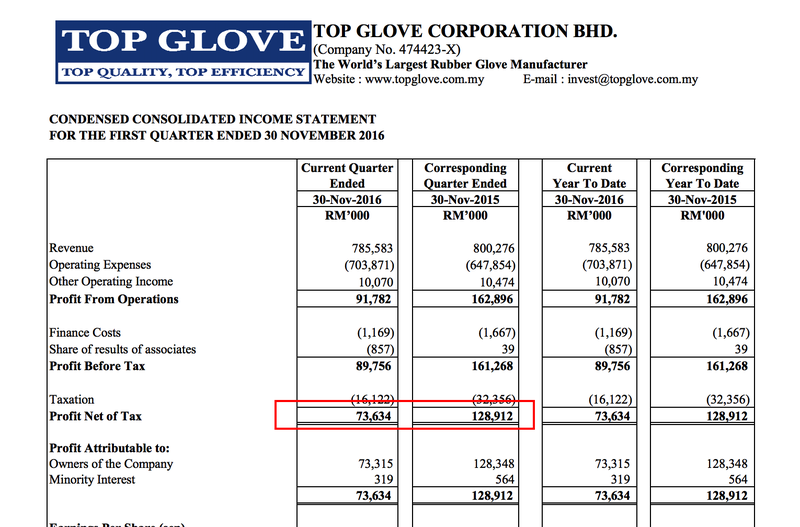 Of course, the companies claimed that they are better in costs control, manage the companies better (Hey, nobody would say that they are not good) but in actual fact it is the Ringgit vs Dollar - STUPID! It is the low oil price and price collapse in almost all other commodities - copper, gold, palm oil, iron ore, cotton. That's the story of 2015. Now, if oil can drop to USD36 from USD100 a year ago, can it go back to USD60 in a year? What if Ringgit improves to 3.70 or 3.80 - let's not be too optimistic that it would go back to the level we see 18 months ago i.e. 3.3. What would happen to all those super performing companies in 2015? Would they look like an Average Joe again? Let's not forget their extra margins for 2015 was the currencies. Nothing else! But all of a sudden we think these companies are superstars. They are not. They are good but not extraordinary. One if looked further will know that the owners are not stupid and they have been selling. They know that this unusual situation does not come all the time and will not last. But we are that stupid to chase for them to sell. Why did I highlighted that. 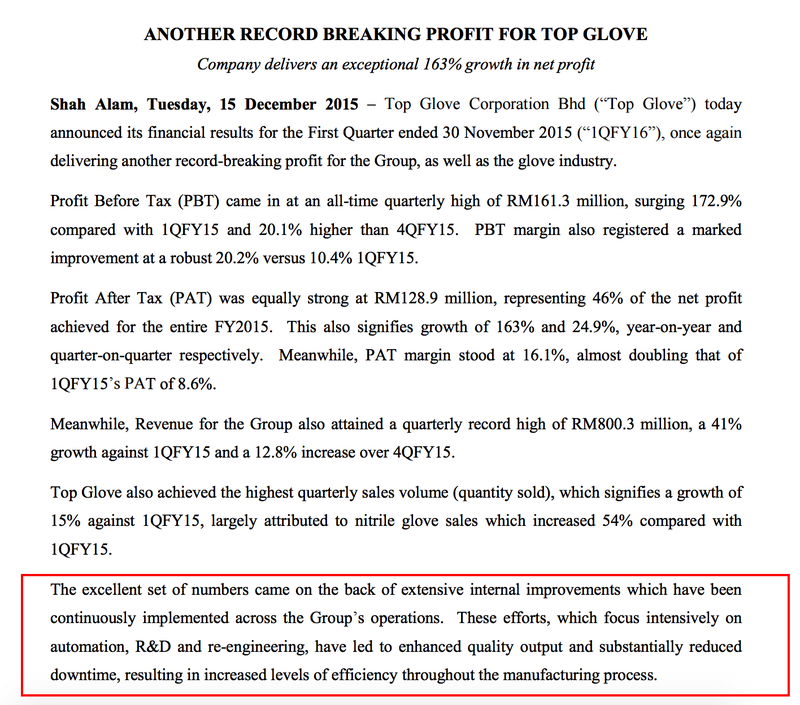 Well, as below is the press release after Top Glove achieved its best ever quarter in 1Q2016 (ending October 2015) i.e. last year. If you read the last sentence, "While we have benefited from the USD, our performance is not reliant on tailwinds, the effects of which are only temporal," Tan Sri... clarified. What has it achieved in the same comparative quarter for this year? 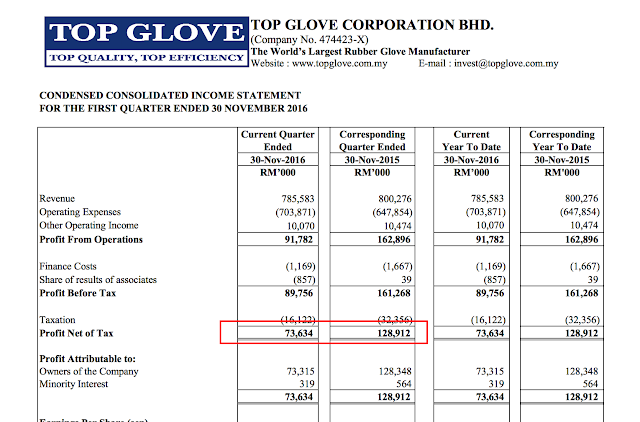 As below for same quarter in comparison, its Net Profit dropped from RM129 million to RM73.6 million. So what happened to the statement "not reliant on tailwinds." I am not here to attack but when a company wants to provide "releases", guidance, projections etc. they have to be HONEST. Again, Top Glove has done well enough to not having the need to do this. You know, in some markets, the management can be sued by shareholders. 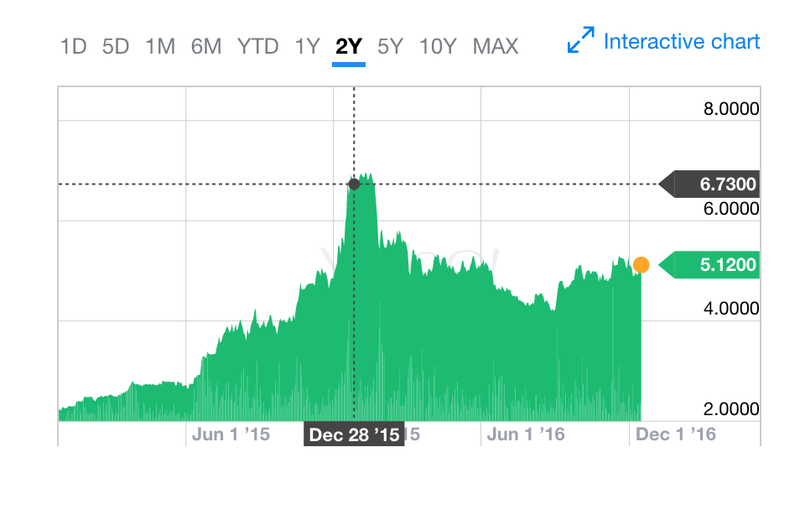 This is its share price after the record profit quarter last year.